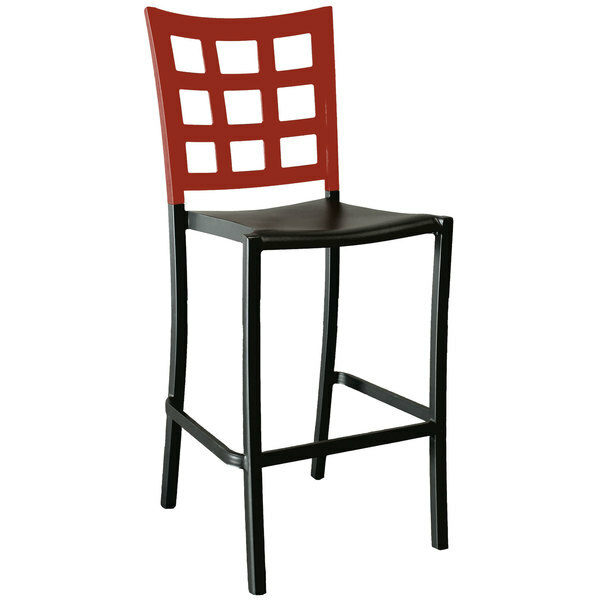 Add contemporary flair to your dining establishment with this Grosfillex US640202 / US046202 Plazza charcoal barstool! Featuring a high, contoured backrest and a convenient footrest, this barstool helps reduce pressure on guests' legs and back to ensure maximum comfort and support. Its attractive, apple red window back design combines with a charcoal seat, adding distinct visual appeal to any restaurant, bistro, or bar. This barstool's powder-coated aluminum seat and legs provide exceptional durability and a modern aesthetic. Plus, its impressive 300 lb. capacity is sure to provide years of reliable use in your establishment. Add this sturdy, stylish barstool to your indoor dining area and ensure your guests comfortably enjoy their dining experience!